SignSupplies2Go.com sells a variety of wholesale lighted sign supplies for use in professional, retail, and service settings. Our lighted signage includes information signs, light boxes, and these message boards. This sign supply, also known as an illuminated poster frame, is the ideal way to provide custom information you customers on a daily basis. The write-on, wipe off surface makes it easy. What makes this sign supply a better choice than our standard message boards? This wholesale sign supply has a black background. This background of this lighted sign makes neon colored messages glow, which increases the visibility of your signage. This sign supply is available in a variety of sizes and allows for the demonstration of 13 lighting options. It can be mounted vertically or horizontally depending on the available wall space. 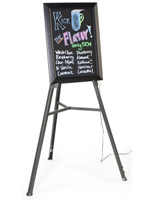 This sign supply can even be set up on a tripod easel, which requires no wall space at all! 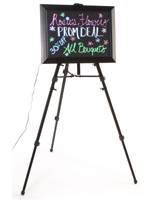 Check out our entire selection of lighted poster frames and message boards online now! Does this wholesale sign supply have any distinguishing features? This lighted signage, sign making equipment, includes 13 light effects that make your sign really stand out. The light effects may be set with the push of a button! It's that easy to create dazzling signage that everyone will notice and remember! Where would you use this wholesale sign supply? 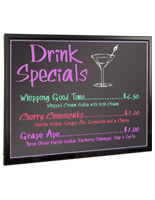 This illuminated signage, 42" x 18" and 18" x 25" LED lit sign kits, may be used anywhere! All a company needs is access to an electrical outlet! That makes this sign making kit the perfect equipment for the restaurant industry as they display daily specials, retail outlets that promote clearance sales, service establishments that offer special incentives to current and prospective clients, banks that want to promote a new type of checking account or favorable interest rates, and even hotels and motels that want to attract attention to special guest services or hotel events. 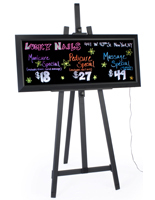 This signage equipment, also called marker boards and light boxes, is the ideal sign making equipment to get every advertisement noticed. 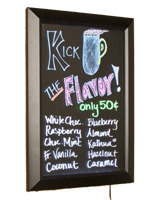 With programmable, edge-lit technology these signs attract attention with flashing lights and neon messages. 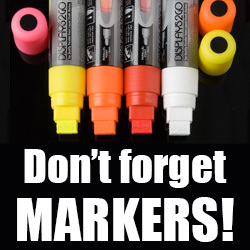 The sign making kit includes board, wet-erase markers in fluorescent colors, hanging kit, and cleaning cloth. This signage includes LED lighting, which is not only economical to run but lasts longer than incandescent, neon, and fluorescent lighting. (LED lights do not use mercury, so they are the eco-friendly choice, as well!) Several models include an easel stand, while some just include the hanging hardware needed to hang the units from the wall or ceiling. Just one style of lit sign included in our company's online wholesale, catalog, this signage is easily noticed from a distance. 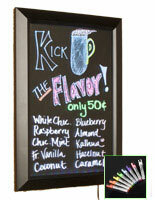 It provides a bright, cost-effective way to present customized messages to current and potential customers. Simply write out your ad, include hand-drawn pictures if you desire, and get important information out for all to see. These models are the perfect way to draw attention in any setting! 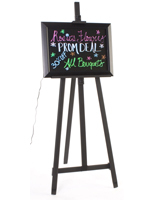 Check out these wholesale sign making kits now!